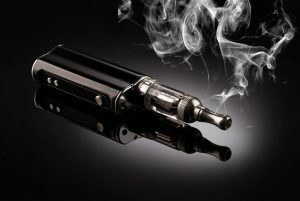 Since their debut in 2004, electronic cigarettes or e-cigarettes have steadily grown in popularity. Approximately 9 million U.S. adults regularly use e-cigarettes, and that includes a growing number of teen-agers. In 2015, one in six high school students reported using an e-cigarette in the past month. E-cigarettes are battery-powered devices that change liquid nicotine into a mist, or vapor, that the user inhales. They don’t use fire or produce ash. There’s no smoky smell. They even come in flavors such as chocolate, strawberry and pina colada. And because they don’t contain the tar and other chemicals included in tobacco cigarettes, they are thought to be healthier. But are they really? First, it’s true that smoking an e-cigarette is less harmful than smoking a tobacco cigarette because e-cigarettes contain significantly fewer toxins compared with tobacco cigarettes. But there are still toxins in the aerosols used in e-cigarettes and in the flavorings. In fact, a 2017 study in the journal Cardiology found the second-hand smoke from e-cigarettes may be harmful to others depending on the type of device and liquid used. E-cigarettes were originally designed as a tool to help smokers quit, similar to nicotine patches. And there is some evidence they can be used in place of tobacco cigarettes. But additional evidence demonstrates that using e-cigarettes can be a gateway to smoking, especially for adolescents and teens, or in conjunction with other tobacco products. There is concrete evidence that nicotine is addictive and harmful, especially for youth. It can make it more difficult for young people with developing brains to concentrate, learn, and control their impulses. And because nicotine is addictive, it can prime young brains to become more easily addicted to other, more dangerous substances. What seems to be equally problematic, according to the reviews, is the marketing of e-cigarettes. Advertisements tout e-cigarettes as cheaper and cleaner than tobacco cigarettes and promote them to use in places where traditional smoking is banned. Advertisements for tobacco cigarettes have been banned from television and radio since the 1970s, but this ban doesn’t apply to e-cigarettes. Advertisements on social media sites tout e-cigarettes’ high-tech features and flavors, which may help them appeal to youth. The take-home message? While e-cigarettes may help some people quit traditional smoking, using them as a recreational product can still harm health, especially for young people.